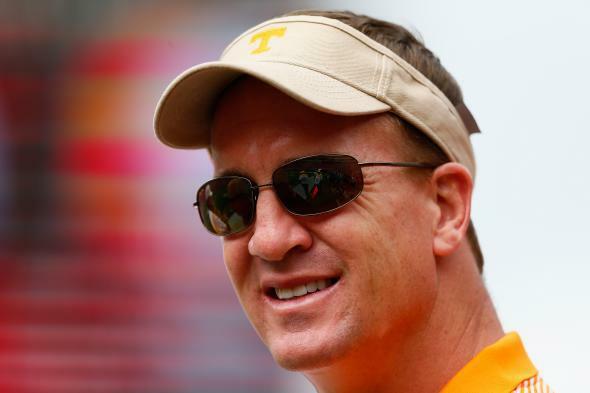 Tennessee wants Peyton Manning sexual assault allegation out of Title IX suit. Peyton Manning looks on from the sidelines during the game between the Tennessee Volunteers and the Georgia Bulldogs on Sept. 27, 2014. The Univ. of Tennessee, facing a federal lawsuit filed earlier this month that makes sweeping allegations of institutional negligence in handling alleged sexual crimes committed by its athletes, filed a motion Tuesday to strike a single paragraph from the complaint. The offending paragraph just so happens to be the suit’s reference to alleged sexual misconduct by former Vols quarterback Peyton Manning against a female trainer. The motion filed by the university states that the allegations leveled against Manning, a favored son of the institution, are “immaterial, impertinent, and scandalous” and only included to drum up interest in the “meritless lawsuit.” The motion dismissed statements made elsewhere by opposing counsel that the Manning incident, among others, showed a pattern of institutional failure.